Fortress Of Freedom Board :: View topic - Occupy Wall Street: Toronto! 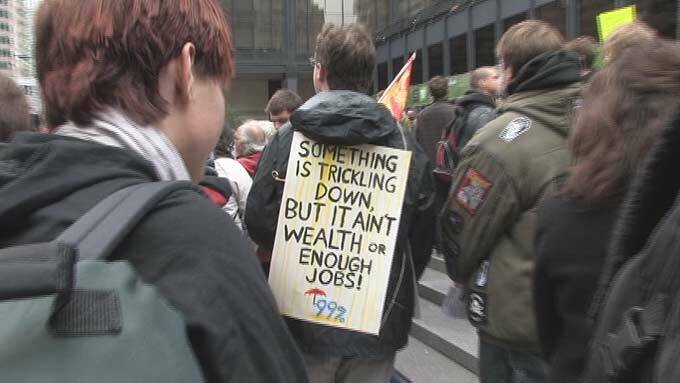 Posted: Sun Oct 16, 2011 5:04 pm Post subject: Occupy Wall Street: Toronto! Toronto, Canada October 15, 2011 The Occupy Wall Street protests which originally started in the United States moved globally on Saturday with big protests in London, England and Rome, Italy. 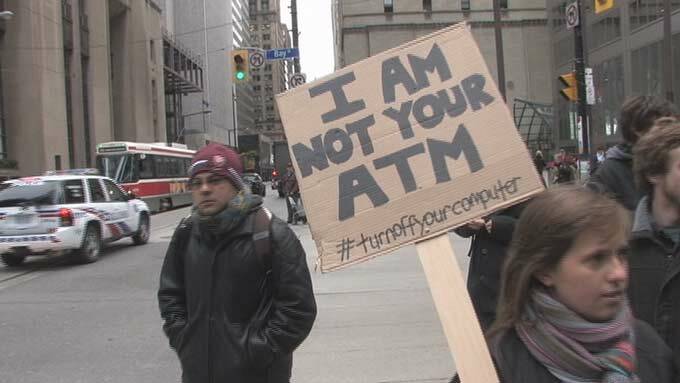 Here in Toronto we had a one such protest called "Occupy Toronto" at King Street and Bay Street in the heart of Toronto's financial district. The group planned to meet at 10:00AM on October 15, 2011. The large crowd at King Street and Bay Street! 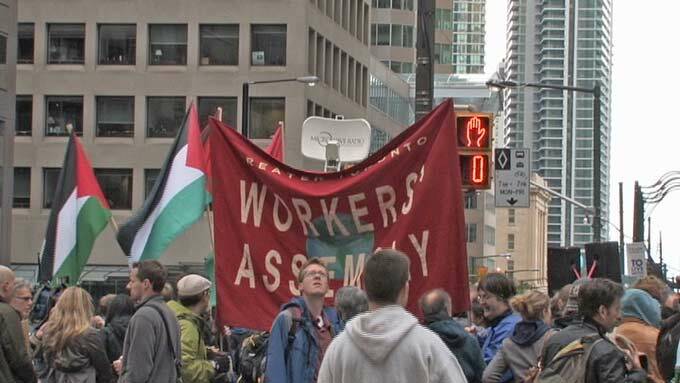 A group of us from IAIJ (International Association of Independent Journalists) arrived just after ten and found about 1,500 people on the south west corner of Front Street and Bay Street across from the CIBC bank. As with the G20 Protests a year ago there was a strong police presence and security firms had beefed up staff within several blocks of the area. A handmade placard which was typical of most. There was music playing, for example "Rage Against the Machine" and other anti-establishment music over a loud PA. Supposedly this mob was there to criticize the financial industry for the current economic downturn and indifference to the plight of the ordinary citizen in these times of financial uncertainty. I can say this from what was written on the placards, but you would be hard pressed to come to that conclusion based on anything more prominent in this mass of people. There were interviews but no one person or organization seemed to be in control of the crowd. The crowd was also host to many of the usual organizations taking advantage of the press attendence for the protest. This is significant as the news media seem to meander through the crowd looking for someone who actually had a handle on what the purpose and plan was for the group as a whole. They had trouble finding it. More placards at the protest! You can judge a protest that has solid funded and organized backing by the placards they carry. There were a few that looked like they had been manufactured at some printing company but most were hand made. This was a gathering of all kinds of people. A herding mentality in action to people concerned over the economic well being of their community. There was no real podium with a list of speakers, just small interviews scattered around with unknown interviewers and interviewees alike. This in stark contrast to most protests we have covered in the past. 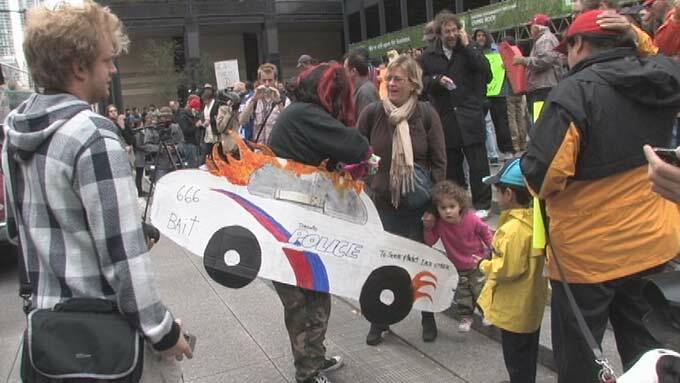 A G20 "sandwich board" at this protest! Since the group had no real agenda or plan for the day we left after taking some video and listening to a few of the participants. One of the few organizations at the protest. The group later moved to St. James Park (King Street and Church Street) to camp out and figure out what they wanted to do on Sunday. 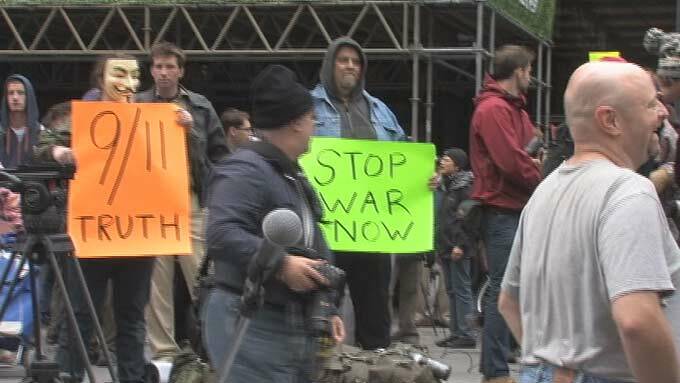 This was probably one of the smallest of the "Occupy Wall Street" protests. Partly I suppose because Canada is one of the better managed of the industrialized countries and we simply have not felt the pain that brought out the larger crowds seen in other countries. Another view at the protest from across the street. It is yet uncertain how long this "occupation" will last or what the groups next move will be. 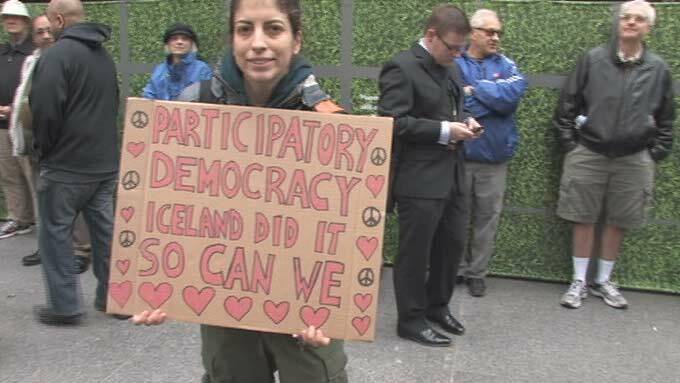 It should be noted though, that these protests seem to have more impact on the people in charge as it is their uncoordinated assembly, as opposed to the professional protestors, that indicate real participation by people who normally do not attend such events. So even though these protests are uncoordinated and ill prepared, they still are having an effect.